AALL Members are invited to join the Leadership Development Committee’s webinar entitled Anticipate as a Strategic Leader, on Thursday, May 28, 2015, at 11:00-11:45 am Central time. The webinar is presented without cost to members of AALL. Guest speaker Franklin Shen, consultant with Decision Strategies International, will introduce participants to the six elements of strategic thinking, highlighting one of them: Anticipate: Focusing on the need for leaders to anticipate, be prepared for, and lead through change. Webinar participants will learn how to examine outside and inside forces and expand their own strategic thinking capability. Moderated by Patrick Butler, Electronic Resources and Reference Librarian, University of Connecticut School of Law Library, this event is the precursor to the upcoming program entitled Thinking Ahead: Encouraging Strategic Thinking in the Library at the AALL Annual Meeting and Conference. Mark your calendar and join us for the webinar. Registration deadline is May 25, 2015. Non-AALL Members can join the webinar for a fee of $60.00. Last November, the Lane Powell library put on an evening showcase to highlight select electronic resources. 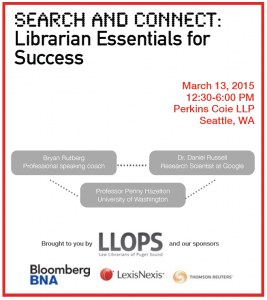 Attorneys turned up for a wine and resource pairing, and learned new tools and search tips. Join us to learn how Philippe Cloutier and Laurel Evans developed and facilitated this event at their firm. Where: Lane Powell, 1420 5th Ave #4200 Seattle, WA 98101 42nd Floor Conference room – behind the reception desk. Please have your ID with you. On May 27, 2015, LLOPS will be hosting AALL Executive Board Member, Donna Nixon from the University of North Carolina at Chapel Hill, Katherine R. Everett Law Library. 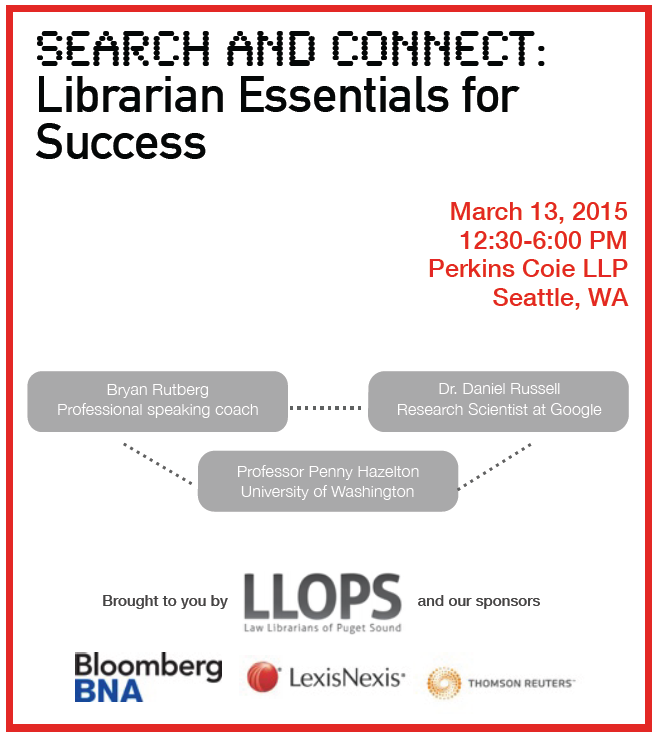 Donna will be leading a discussion on the topic of training attorneys to perform legal research. Donna will lead a panel to discuss legal research training provided by law school vs. court librarians and law firm librarians. The meeting will be held at the William K. Nakamura US Courthouse. And, LLOPS will be providing free lunch (pizza and salads)! We have two law firm librarians, Jessica King from Perkins Coie, and Sarah Andeen from Williams Kastner, who have agreed to sit on the panel. We would love to have one or two court librarians join them. Please contact Brenna Louzin if you would like to join this panel. Registration is open for the 108th Annual Meeting & Conference in Philadelphia. Join us July 18-21 for four full days of exciting learning opportunities, from the keynote address by Terry Gross to the dozens of “must-have” programs on timely topics that AALL members have identified as vital to their professional education. Check out all the sessions, and start making plans to join us. Save the date for the AALL Business Skills Clinic, a two-day intensive experience designed to give you skills in strategic planning, managerial finance, human resources, negotiations, and marketing/communications. The program will be held October 16-17 at the Hyatt Chicago Magnificent Mile Hotel in Chicago. Contact Katie Brown, Chair of the Business Skills Education Task Force or Celeste Smith, AALL’s director of education, for more information. 1) Look at the proposed sessions and if you see something you like, vote for it! That helps us decide the final schedule. The voting link appears at the bottom of a session description next to the social media share button. Speaking of which, feel free to share your sessions on social media and hustle for votes. Please note: CALI cannot condone or endorse bribery. 2) Attend! The sessions are only a part of the value of CALIcon. Past attendees report that they enjoy the “HallwayCon” and interaction with other attendees almost as much as the sessions themselves. Besides, it’s silly to give a presentation to an empty room. To register, please visit the CALIcon Registration page and follow the instructions. If you attended last year, you can use the same username/password that you used then. However, if you did not attend last year, you’ll need to create a new account, even if you have attended CALIcon in the past. The Grants Committee is accepting applications for AALL 2015! If you are interested in attending and would like assistance with registration, please fill out the 2015 Grant Application and return to Carly Eyler by Friday, May 1, 2015. We are looking forward to hearing from you and hope you take advantage of this great member benefit! Do you like food, drinks, learning, and winning? Comments Off on Do you like food, drinks, learning, and winning? Come for the programming and stay for the networking! In addition to our amazing line up of speakers, we will have time for you to meet with your colleagues and vendors over beverages and tasty snacks. We will close our networking activities with a drawing for… well, you’re just going to have to come see for yourselves! You have ONE MONTH to propose a session for CALIcon15. How have you used technology in your classroom? What is a cool tool you made with a Raspberry Pi? Did you solve the problem of keeping ebooks in your library’s collection? Tell us all about it! Don’t worry if you think your idea is not good enough- we’ll be sure to crush your hopes and dreams when we vote on presentations after April 3. Go to http://conference.cali.org/2015/, log in if you registered last year or register on the site and submit a presentation. If your presentation is selected, you get to attend CALIcon for the low, low, LOW price of $95. The Grants Committee is still accepting applications for the Spring Professional Development Workshop! If you would like help covering the cost of registration, please fill out the 2015 grant application and return to Carly Eyler by Wednesday, March 11th. To register at the Individual or Associate LLOPS Member level of $60, you must log in to your wild apricot account. Please contact Kim Ositis Kim.Ositis@kingcounty.gov if you need assistance with your account.